Today the Beaver Island Volleyball Team traveled to Mackinac Island for their last Northern Lights League matches of the season. Before the tri-meet (Hannahville, Beaver Isl and Mack Isl) started, Hannahville had 2 league losses, Beaver Isl had one, and Mack Isl had zero. So, we knew had to win both matches and we needed Hannahville to beat Mackinac in order for us to take 1st place by ourselves (and not have to share it with Mackinac Island). In a very close, exciting match, Hannahville DID beat Mackinac! Then, they both had to play another match, but Mackinac won that one. We then were up against Hannahville. It started out with a very close game, Beaver Island winning 25-22. We then went on to win 25-15, 25-11. Then were up against Mackinac Island. Both teams played great and there was a lot of hard serving, hitting, and more blocking than we've seen all season. It was definitely high-level, competitive volleyball -- just the way we like it! We played hard, but we lost the first game 25-14. We did some talking and fine-tuning of our game. We came out hard at the start of game two and won 25-7! But, then, of course, Mackinac Island fired up again and won game three 25-19. We had to win game 4, or we would lose first place. The Lady Islanders really played great and won 25-21. That sent us to a tie-breaking game of 15 points. We've had trouble in the past with tie-breakers. In a surprising move, the Mackinac team chose to receive the ball when they won the toss. We thought that was a great decision -- as we wanted to serve the ball first! We are a strong-serving team (when all is going well). We got a few points right off the start. But, then the game was neck-and-neck all the way. When we were up 9-8, the other team called a time-out. I told my team that we were playing great all day -- just keep it up, don't worry about winning or the score -- just keep making "one good play" at a time. That's all it took for them to hear and we stayed strong til the end, winning 15-12! Your Lady Islanders are the 2008 Northern Lights League Volleyball Champions! I am truly proud of all these girls. Each of these 8 girls all had specific jobs to do and they all performed at an outstanding level. They played hard, never gave up, and played great volleyball. Playing today for the Lady Islanders were: Seniors: Caitlin Boyle, Deven Cook, Maeve Green, Heather McDonough Juniors: Kristy Bousquet, Jenna Butler, Alex Kuligoski Freshman: Jenna Battle Here are a few stats from the weekend. Keep in mind that we couldn't possibly record all the good plays and stats. And, there were a lot of awesome plays that the girls on the bench with me would ask, "what's that?" And I'd have to answer, "there's no stat for that -- but it was a great hit or a great save!" The whole day was great. Everyone worked hard, met the challenges and ended the day victorious! Next Saturday we're off to our District Tournament at Pellston, where we'll play the winners of the Pellston/Harbor Light Christian match. Ours will be the third match of the morning (the first one is at 10:00 am) -- so the earliest we would be playing would be noon. The LIGHTHOUSE FELLOWSHIP is having a FREE PANCAKE/SAUSAGE SUPPER w/ fruit, coffee, lemonade and dessert. We are doing this in celebration of our one-year anniversary as a church on Beaver Island. Food served between 5:00 p.m. & 6:45 p.m. at the Peaine Township Hall, on Friday, November 14, 2008.. Everyone is invited. The Beaver Island Rural Health Center announced today, Wednesday, October 29, 2008, that flu shots will be provided without charge for all kids ages birth to 19 years of age. Call for an appointment. Absolutely no charge will be assessed. Jerrie Lou (Hendricks) Turner Williamston Born September 1, 1930, in Shiawassee County; died October 26, 2008, at the age of 78. Jerrie was employed with Felpausch, in Williamston, for 19 years. 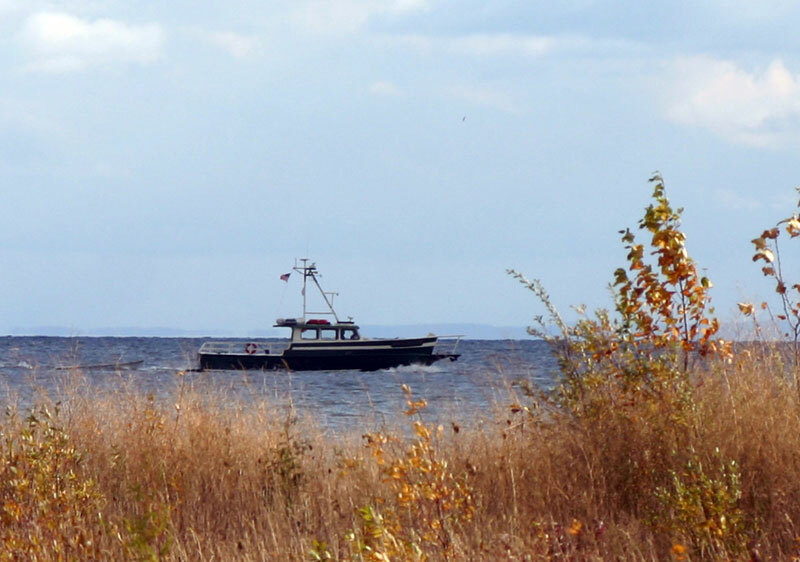 She was a member of the Economic Development Committee for many years and enjoyed her summers on Beaver Island. Surviving are William, her husband of 11 years; her former husband, Thomas J. Hendricks; daughter, Terrie (Thomas) Boggus; sons, Thomas (Patricia) Hendricks, H. Todd (Bonnie) Hendricks, Timothy (Deborah) Hendricks and Trent (Sharon) Hendricks; grandchildren, Kaylynn, Anthony, Jessica, Michael, David, Leah (Kevin) and Kayla; great-granddaughters, Kennedi and Harmony; and brother, David (Natalie) Lucas. Memorial services will be held Thursday, October 30, at 11 a.m. at Trinity Church, 3355 Dunckel Rd., Lansing, (off Jolly and Dunckel), with the Rev. Royce H. Allen officiating. The family will receive friends at the church on Thursday 1-hour prior to the service. Those desiring may make contributions to Hospice of Lansing, Stoneleigh Residence, 3411 Stoneleigh Dr., Lansing, MI 48910, in memory of Jerrie Turner. The family is being served by the Gorsline-Runciman Funeral Homes, Williamston. Glen Wood has passed away. Glenn L. Wood, 74, of Beaver Island, died Friday, October 24, 2008, at Northern Michigan Regional Hospital in Petoskey. Glenn was born September 11, 1934, in Edmore, MI to Elmer and Leora (Stephens) Wood. He graduated from Edmore High School, served with the US Navy, then attended Central Michigan University, and University of Michigan Banking School. He retired from banking as Senior Vice-President of Chemical Bank in Stanton, MI after forty-two years. Glenn was past President of the Rotary Club in Stanton. On July 16, 1965, Glenn married Kathleen Gatliff in Edmore. 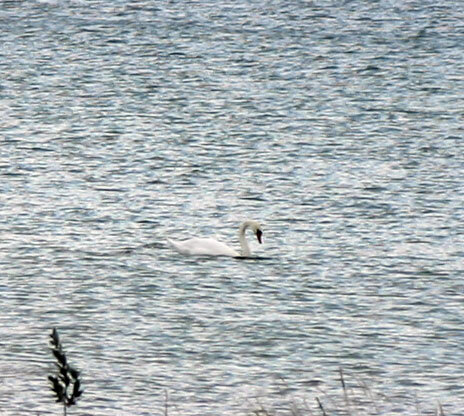 They made their home in Six Lakes and Beaver Island before moving permanently to Beaver Island in 2005. He was a member of the Holy Cross Church on Beaver Island. Glenn is survived by his wife, Kathleen; sons, Chad (Toni) of Lawton, Coley (Terrie) of Lakeview, Shane (Tracy) of Cedar Springs; grandchildren, Mackenzie, Jacob, Dawson, Devin, and Samantha; brother, Keats (Neoma) Wood of Vestaburg. Glenn's brother Eugene preceded him in death. A memorial mass will be held at 11am Saturday, November 1, at Holy Cross Catholic Church on Beaver Island. The Reverend Patrick Cawley will officiate and interment will take place in Holy Cross Cemetery. Memorial contributions may be made to the Holy Cross Cemetery Fund, Beaver Island, MI 49782. The Winchester Funeral Home in Charlevoix is serving Glenn's family, (231) 547-2881. Central Michigan Biological Station will be hosting their annual Closing Party on Saturday, November 1, 2008. Come out to see the new Jim Gillingham Academic Center, to socialize, and to eat a wonderful dinner. There is something very special about the fall season. On of those things is the beauty of the leaves on the trees known as fall color. 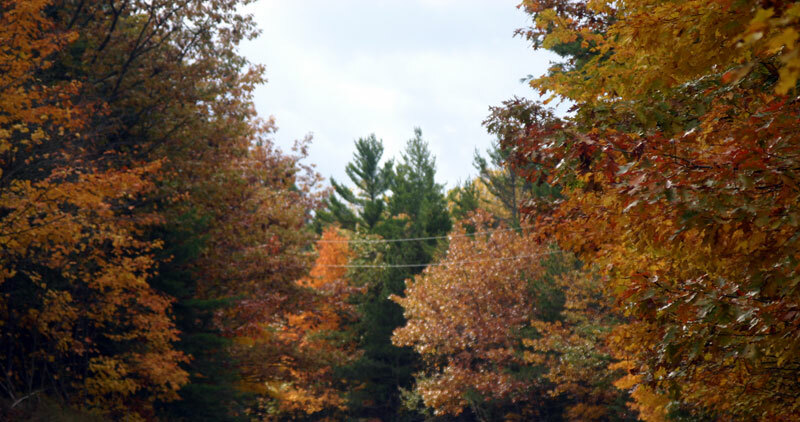 The leaves are still quite beautiful when they first fall to the ground as well as can be seen in the picture above. Even without the bright sunlight, the colors of fall abound. Just another beautiful fall day on Beaver Island with gusty winds stranding several visitors because the boat did not go today. One visitor who was stuck here due to the stormy, windy weather said, "You have a beautiful island here. I get to enjoy it for one more day, rain or shine, and it looks like its going to rain." He was right on both counts. It is beautiful here and it did rain. Even though it looks deserted, the harbor is pretty this time of year when seen from Whiskey Point. A dive boat coming back from the outer islands. Sunshine on Garden Island was selectively seductive. 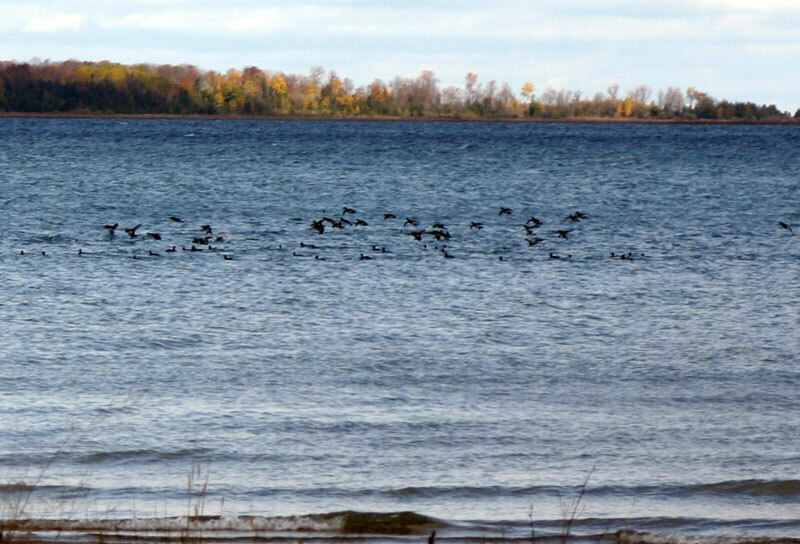 The water birds gather before the migration begins. Look closely, you might miss the reason for this photo. 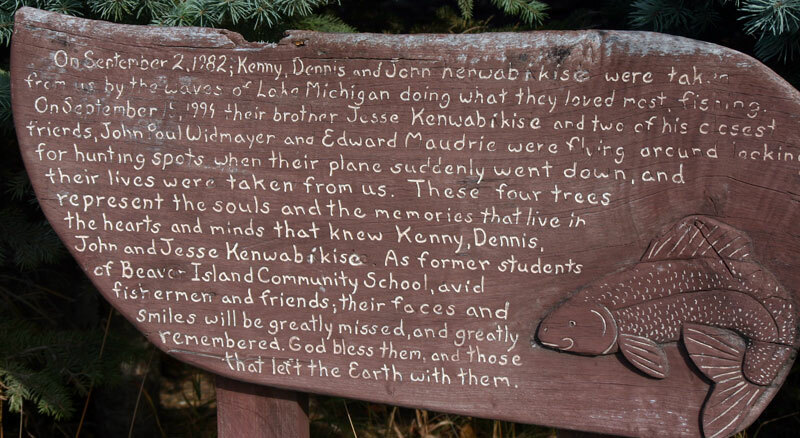 For some of us on the Island, this placque has very special meaning. Do you know where it is located? This past week saw quite a few accomplishments. Great Lakes Energy was here to set a new transformer for the new school building. This required the power to the building to be off for a couple of days, but that did not slow down the work there. If you drove by and listened, you could hear the generators running from about 8 a.m. until a little after 10 p.m. at night. The pictures of Sunday's walkaround are HERE. 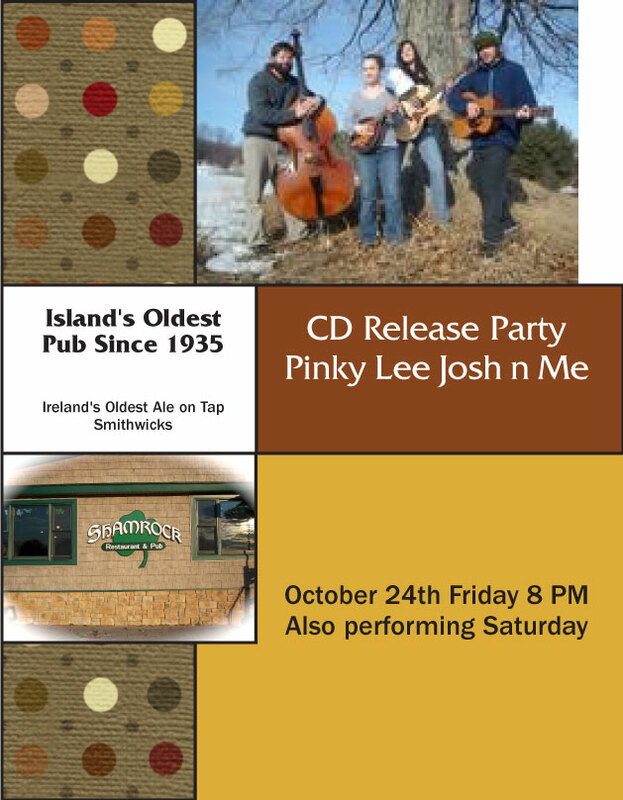 CD Release Party for Pinky Lee, Josh, 'n Me took place at the Shamrock on Oct. 24, 2008, at 8 pm. Just type Pinky Lee Don't Ya Know into the search box, and you can get one song or the whole album there. Each song is just $.99. Pictures from the Mackinac tournament HERE. The Beaver Island Chamber of Commerce board of directors will hold a Members Input Reception on Thursday November 6 from 5:00 to 7:00 PM at the Shamrock. The Chamber will provide hors d'oeuvres. Members, their guests and potential members are cordially invited to attend. “We want your comments and suggestions about the Celtic Games, Bite and Boodle. We would appreciate your ideas about how we can most effectively market Beaver Island,” said Chamber President Kathy Speck. The board will thank the volunteers who helped out this summer and give a report on the increase in visitor traffic at the Chamber as well as extended visitor information and literature availability hours at the new Community Center location. “Our advertising theme -You've never been to Beaver Island? – has helped with marketing our shoulder season. However, there is plenty of room to do more,” said Chamber Executive Director Steve West. The Chamber of Commerce 2009 membership drive is now underway. New business memberships start as low as $150. 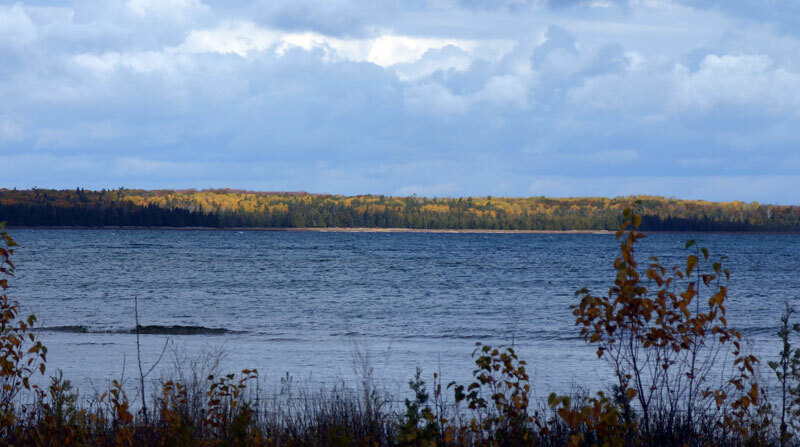 About half of the group's annual budget is spent directly on marketing Beaver Island. 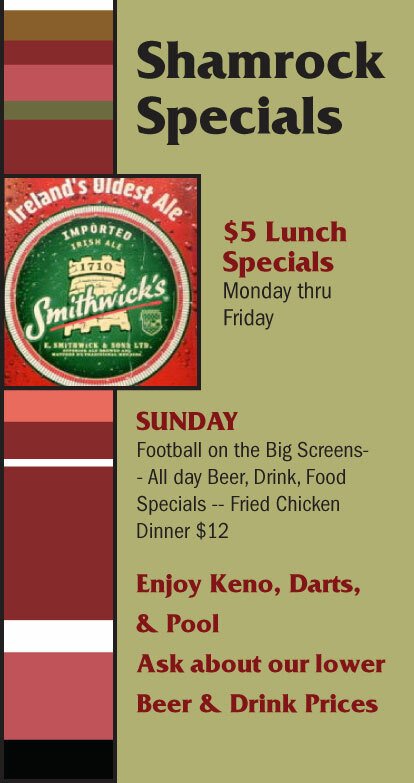 For more information call (231) 448-2505 or look at the Chamber web site www.BeaverIsland.org . 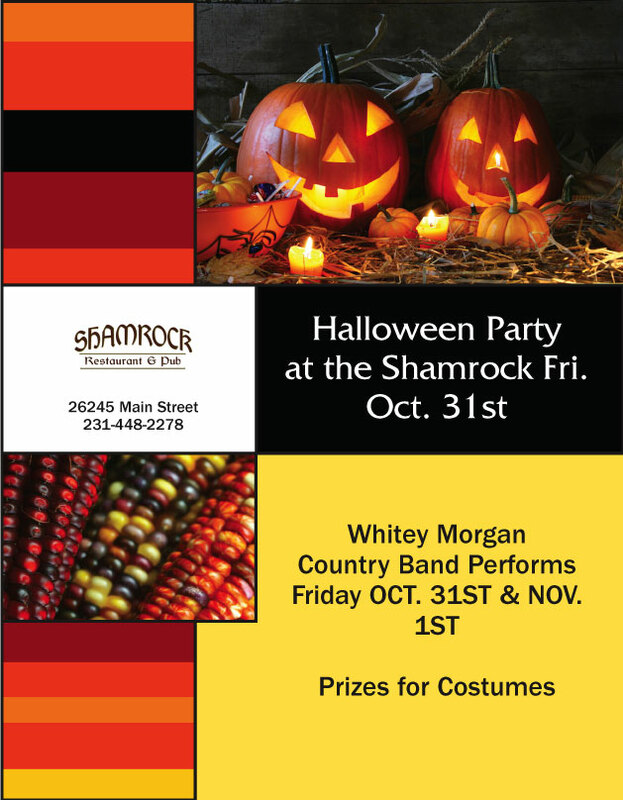 The annual Halloween Party will take place at the Shamrock on Oct. 31, 2008, and will feature the Whitey Morgan--Country Band. They will also be performing on Nov. 1st. Chiropractic service is now available on the island. Dr. Jessica Carden, a licensed chiropractor has already come to the island and the interest has been great enough that she will be here on Thursdays, October 23, November 6, November 20, and continuing every other Thursday throughout the winter. Appointments can be made by contacting Betty (448-2275) at the Health Center . Nationally board certified in acupuncture and Chinese herbology , Tamara Graf will be coming to the island on a regular schedule on dates to be determined as of this writing. Ms. Graf is a graduate of SAMRA University of Oriental Medicine in Los Angeles and practices in Traverse City . She will be offering help in holistic health, nutrition, smoking cessation, chronic pain, headaches, arthritis, and low back pain. Yoga Classes will be held on Thursday evenings, at 6 p.m. at the Peaine Township Hall starting October 23 rd .. Cost is $10 per class. Classes will be taught by a yoga instructor coming from the mainland. No prior experience is necessary to take the classes. Flu shots are available at the health center now. There is no charge for Medicare cardholders. Pneumonia shots, which are needed only once every ten years, are also available. The Health Center is also equipped to provide Medicare physicals which much be taken within six months of enrollment in Medicare. The physicals include EKGs and blood tests, all of which can be performed at the Health Center . The Health Center staff can also perform the physicals necessary for a pilot's license and boat captain's license, school physicals, and drug screenings. The two physicians who come to the island regularly have announced their November schedule. Dr. Mann will be here Tuesday, November 11, and Dr. Newcomb will be here Tuesday, November 25. December's schedule will be available in November by calling the Health Center . Appointments can be made by calling Betty, 448-2275. This is FREE BRUSH MONTH at the Transfer Station. Free brush includes twigs and small branches, not cut down trees etc. Leaves are free anytime. This announcement was given at the BI Christian Church last Sunday, but Judi Meister wanted it to go out to anyone that might read it on this website. Congratulations, Dale! The Transfer Station is selling woodchips and will until the road back to the woodchips is impassible, Anyone wishing to buy some woodchips must contact Darrell Butler, Jr. @ 448-2896 to make arrangements. The price is $8.00/yard if Darrell loads it or $6.00 if the person loads it themselves. Darrell still needs to be contacted either way. A reminder from the Transfer Station crew: The hours will change beginning November 1. The Transfer Station will be open from 11 a.m. until 5 p.m. Monday through Saturday starting November 1st. Also, the Transfer Station will be closed the opening day of the firearm deer season. With the fire department and the EMS services very busy these last couple of weeks, can you guess the maximum number of patients that BIEMS has had to deal with all at the same time? There was only one guess regarding this question. The number of that guess was three. Perhaps you would be interested in knowing that our local BIEMS assessed and treated a total of 8 patients and got signed releases from all of them when a problem arose at the public marina. There have been several businesses located in the building across from the Shamrock. This building now houses LakeSports. Does anyone recall the business that was located there last, before it became a private residence and then became LakeSports?